This Harmony sprouts more buttons and a quicker interface. Please note that since this review, "Intrigue Technologies" has been purchased by Logitech and the SST-659 is now known simply as the 659 or H659. Look at any number of standard universal remote controls and you’re likely to note one similarity: a cluster of buttons at the top, each labelled with a different component type. “TV”, “VCR”, “DVD”, “DSS”... anyone who’s ever used a remote will be familiar with the device-based control concept, where you hit the button corresponding to the device you want to use, do whatever needs to be done, and then press a different button to switch to the next component. This approach may be the overwhelming industry standard, appearing on practically every remote control ever designed, but that doesn’t mean it’s the only way to operate your home theater – or even the best way. If you’re tired of the whole device surfing routine and are looking for something a little different... even possibly better... you’ll want to take a look at a more innovative control idea: activities. Activities are logical, intuitive and efficient. Imagine the typical steps needed to watch a DVD movie: power everything on, change the television input and screen mode, set audio input and decoding format, dim the lights, then finally start the movie playing. On a typical remote you’d need to jump around to 3 or 4 devices before the task is completed. 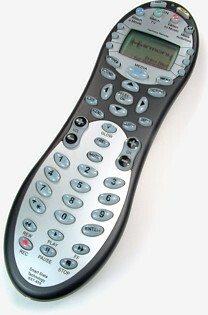 But with an activity-based remote, you’d simply press the “Watch a Movie” button, sit back, and relax. This sounds a lot like macros, right? In fact macros are a critical aspect of the activity concept – but there’s also much more. For example, once in the “Watch a Movie” activity, a good activity-based remote won’t besiege you with an abundance of utterly useless commands that you’ve never used and likely never will. Activity-based remotes instead provide the most logical and oft-used controls for each device involved in that activity. Operate the receiver’s volume and DSP modes, the DVD’s transport and menu controls, the TV’s picture and screen modes, even your lighting system, without all that tedious device hopping. 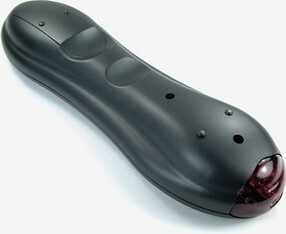 True, many existing remotes capable of macros and learning infrared codes can be manually programmed to operate more or less as an activity-oriented control, but there’s only one remote control product line that has officially adopted the concept and really run with it: Intrigue Technologies’ Harmony. And, to ensure that using the Harmony is a truly memorable experience, Intrigue has also integrated an assortment of extra gadgets such as “Smart State Technology” and a television program guide. Intrigue Technologies is a company that listens to their customers. When the novel “less is more” Harmony SST-745 was first introduced with a scant 13 buttons on its face, Intrigue paid close attention to user suggestions. Soon enough, they brought out the much-refined SST-768. The new high-end model incorporated a polished physical design with a similar (if somewhat opposite) philosophy: “more in less is more”. Specifically, an incredible number of buttons delicately sprinkled into the smallest space possible. Our “buttons per square inch” meter spiked.